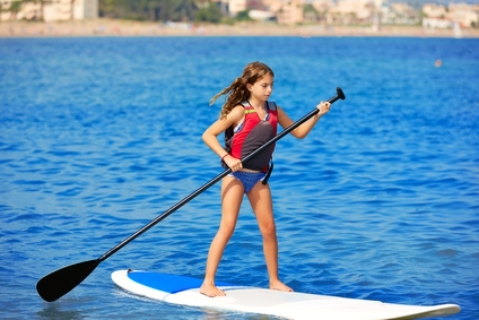 Kids Stand Up Paddle Boards: We Make Picking The Right One EASY! Not only do we have the best SUPs for kids, we have the latest 2018 paddle boards for kids in our list! You know young ones, they gotta have the newest and coolest SUP around. 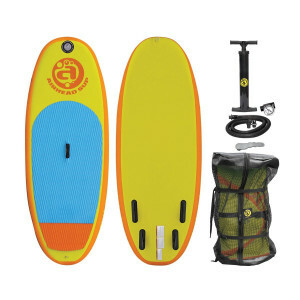 But, before you go spending adult prices on just any ol’ SUP, check out the prices that are ankle leashed to these boards. You might be blown away by a wave of disbelief! Before you add to cart, make sure you know everything about a safe SUP for your child. To instill a lifelong passion for SUPping and the outdoors, it starts with the paperwork and research first. The Lifetime Youth Hooligan stand-up paddle board is an excellent buy if you want to avoid the inevitable damage that’s sure to come! What gives it its pressure and abrasion resistance is the ultra-durable, high-density polyethylene (HDPE) construction. It’s plastic, tough, and guaranteed to take a beating. The 8 foot long and 30 inch wide youth SUP board is plenty big enough to allow riders from 5 years of age and up to 130 pounds. It’s so strong that even an adult can get on board and supervise. To make the solid SUP even better is its retractable fin for ultimate storage convenience and an adjustable paddle that’s thrown in with the purchase. If you think the price is borderline hefty, you should think again when we tell you that it comes with a 5-year warranty. Now that’s a SUPpin sweet deal! The Shredder softboard SUP is top-notch for its class. 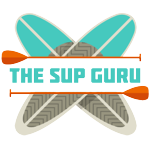 If your kid deserves to splurge, this is the SUP you want them to earn. Everything about the Shredder is superb, from its padded rails for extra SUP protection to its X-EPS foam core that’s been cell sealed and doesn’t absorb water. The center carry handle also doubles as a connection for a sail mast. 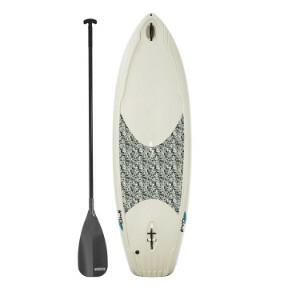 The SUP features a removable tri-fin system, and the whole thing only weighs 19 pounds. While it features a vinyl covering that’s not laminated, you won’t have to worry about delamination. It also has Gore-tex air expansion venting. It’s extremely sturdy and strong since it’s been rigged with patented dual aluminum stringers. Oh yeah, did we mention this thing is super comfy? Yeah, it’s a soft top SUP – gotta love it! If you can get your bum into gear, you can snag the Lucky Bums iSUP at a price that almost seems taboo to say out loud! If you can’t believe it, believe that it has two size options for the kids that’s made out of 500-denier 3-ply PVC reinforced fabric. This means you can get this thing to full PSI and be fooled into thinking it’s a hard board. To make the kids do all the work, the included pump is a dual action pump that can get the 7 foot or 9 foot board fully inflated in no time – 5 minutes tops! Both youth-sized boards are lightweight, and they also feature on-board deck storage with plenty of d-rings. 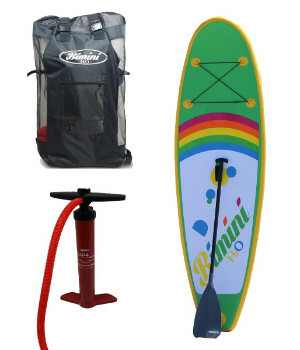 The Lucky Bums package comes with everything you need from a 3-piece paddle, pump, storage bag, and removable fin. Don’t forget you might want to add to cart Lucky Bums’ kayak seat. The Bimini iSUP is way too cute to pass up. Every young lass and lad will gladly do their chores if it means getting their very own rainbow kids paddleboard. With sale prices on the loose, this inflatable SUP is a great deal to rein in. It’s super strong for its 9 foot length, made from military grade reinforced 1100d pvc tarpaulin, and is 30 inches wide for maximum stand up stance. The H2O iSUP has a slightly rockered nose for handling the surf when the kids get brave. Let the kiddos tug this lightweight thing to the waterfront with the two carry handles. Heck, let them inflate it themselves with the dual action pump that’s included in the purchase. What else is included? A backpack carry bag, 2-piece adjustable paddle, and an ankle leash. If you register your product, Bimini will send you a free rash guard too. You know kids, they love their freebies! The Airhead Popsicle is really a paddle board for kids, not an icicle treat or a candy. While it sounds like one and sure looks like it, it will give your kids a jolly ol’ time on the lake. The Popsicle may be short at only 7 feet long, but when you plop your five year old on board, it’ll be perfect! It has a safe, four fin thruster setup to help keep your precious ones on board. It’s 6 inches thick for ultimate comfort in feeling stable and supported, and it’s plenty wide enough to lay down and paddle with 30 inches of generous width. The bright blue EVA traction pad also features an orange tail kicker, and the iSUP weighs only 19 pounds. Feel secure in knowing your kids that weight between 30-120 pounds will have a blast as you tow them through the water. Clean, smart, and sharp describes the austere design of the ibigbean KS82 SUP for kids. The solid colors without any fancy design is actually what speaks to many parents. It’s not busy-looking and it’s gender neutral. However, there may be some fights over what solid color they’d want. We’ll leave that to you. On the flip side, if a fancy appearance means everything to you, ibigbean can actually design the board according to your logo, picture, or sketch requirements – neat! The iSUP itself is almost 8 feet long, is 28 inches wide, and 6 inches thick. If you have cute, chubby kiddos, it can handle up to 176 pounds, so no worries there. The iSUP will ship to you with all the fixings to get paddling immediately. What are you waiting for? 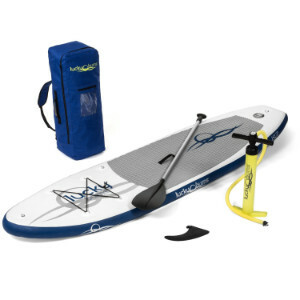 Get SUP shoppin’! We don’t need to tell you that your kid is going to pick up stand up paddle boarding incredibly fast. Just one day out on the water and they’ll be sold for life. The neat thing is, SUPping is an enjoyable pastime, family activity, and sport for users of all ages – kiddos to spring steppin’ oldsters. But, when it comes to picking a youth stand up paddle board or one for the younger kids, various factors come into play. Let’s go over them here. Kids are smaller, lighter, and lower to the ground than us adults. This absolutely comes into play when picking a SUP. First, take into consideration their height and weight. You want to look for a board that’s 28-30 inches wide. Their little, short arms have to be able to reach around the rails to paddle without hitting the board a lot. 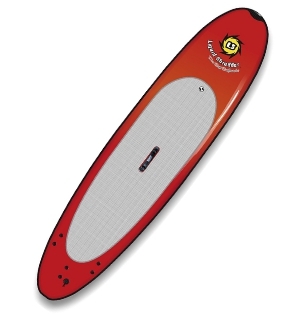 A 7 to 9 foot board is ideal for younger riders aged between 5-10 (30-100 lbs). A 10 to 12 foot board will be great for older children, teens, and adults. Children love to play hard and this usually means that they’re often much more aggressive with their “toys”, including a SUP. You’ll want to look for a kids paddle board with reinforced bottoms and rails to protect the board from scratches, dings, and dents. The best types of durable boards will be inflatables, soft tops, and plastic SUPs. Solid epoxy boards are traditional SUPs, but they’re often prone to damage. Epoxy surf SUPs don’t have the dimensions nor the stability for young and inexperienced SUPpers to start with. 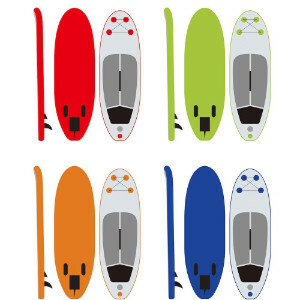 It’s best to look for an all-purpose board such as an all-round SUP or to stick with a flat-water SUP. Kids are notorious for exploring and games, and you don’t want to encourage paddling in rough, unpredictable surf anyway. You might want to consider quality SUP accessories to make paddling enjoyable and safe for your kids. A floating paddle can do wonders. Consider materials such as carbon fiber, wood, or fiberglass paddles. D-rings on board allow for on-deck storage. This can allow them to take snacks, loads of water, and even pack some SUP games on board. A kayak seat can make all the difference to a kid who wants to relax and paddle sitting down. An over-sized traction board can also allow for maximum comfort if the child wants to lay down. For the teens, a Go-Pro or RAM mount might add some filming or snap shot fun to the mix. You might be questioning having to invest in a kid-specific SUP if you really want to make only one purchase that’s suitable for the entire family. You may be asking if it’s okay for your child to paddle on your board? The answer is an absolute yes. There are many youngsters who can paddle an 11 foot board without issue. The key is to be there with them helping them to attain the skills necessary for safe paddling. The longer, wider, and thicker dimensions might actually make them feel more stable. However, it might prove a little difficult for them to maneuver when turning or coming into choppy water and wind. In the long run, cheap paddle boards for children actually turn out to be an asset and an advantage that contributes to peace of mind as a parent rather than a financial sacrifice. Tip 6: Know Your PFD Stuff! Most types of water sports always require the use of a Personal Flotation Device (PFD). For a child, it is required by law for them to wear it while SUPping. When looking for a PFD size for your kid, you want to measure by weight, not by chest size like an adult. It will come as no surprise to find that your infant or child will hate their PFD come time to hit the water. Have your children practice wearing it at home in preparation for the big day and reward them. Turn it into a game – youngins love games! Take it from us, children are fearless and brimming to the top with excitement as soon as they see water. But, the best thing about SUPping is it’s an activity that you can enjoy with the kids, and they with you. Get your skivvies on and climb on board. Explore, fish, meditate, and paddle with the kids. As a parent, you’re in the business of making happy memories. Here’s to a childhood well-lived!